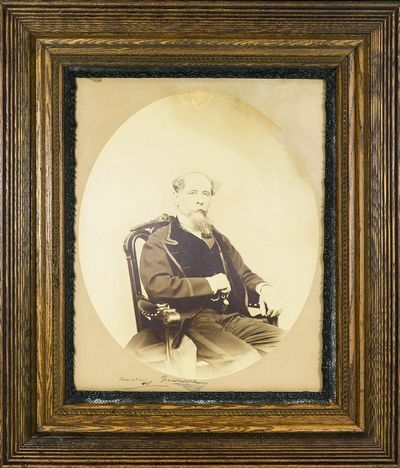 viaLibri ~ Charles Dickens Signed Portrait Photograph. 1868. Large oval portrait photograph measures 20 inches by 116 inches. Matted in a contemporary frame which measures 25.5. inches by 29.5 inches. Signed "Charles Dickens (with a large flourish) Boston Sixth March 1868." In 1867, Charles Dickens began his second American reading tour at Boston's Tremont Temple, where an enthusiastic audience delighted in some of his most notable works, members of the audience included legendary literary stars such as Henry Wadsworth Longfellow and Ralph Waldo Emerson. Although Dickens was in declining health, he embarked on an ambitious travel schedule across the United States. Dickens returned to Boston once more before concluding his U.S. tour in New York City. When Charles Dickens arrived in Boston on November 19, 1867, the celebrated English author spent several days at the Parker House hotel recuperating from the voyage. As conscientious a performer as he was a writer, Dickens had prepared diligently for his performances, redrafting and memorizing key passages from his books especially for these engagements. He used a book only as a prop; he was so familiar with the material that he could improvise with ease. However, during his 1867-1868 tour he was plagued with Flu-like symptoms, insomnia, and an inflammation of his foot, which forced him to walk with a cane. During his last tours in 1868, Dickens confined much of his performances to the New England area. Dickens was grateful for the income he desperately needed from his readings, which generated $140,000, close to $2,000,000 today; but he longed for home. On April 8, 1868, Dickens gave the last performance of the tour. Prolonged applause followed the reading. He closed by telling the audience, "In this brief life of ours, it is sad to do almost anything for the last time... Ladies and gentlemen, I beg most earnestly, most gratefully, and most affectionately, to bid you, each and all, farewell." He died two years later, having written 14 novels, several of which are considered classics of English literature. A desirable piece of Victorian literary history. Charles Dickens was an English writer and social critic. He created some of the world's best-known fictional characters and is regarded by many as the greatest novelist of the Victorian era. His works enjoyed unprecedented popularity during his lifetime, and by the twentieth century critics and scholars had recognized him as a literary genius.